The mist lifted and the sun shone through the clouds, creating islands of light on the glittering sea. A flock of heavy-bodied pelicans filled the sky and to my surprise flitted away effortlessly, followed by a group of graceful flamingos. All this happened in the few moments I spent parked at the water’s edge, as if on cue, before my meeting with Jeanne Meintjes from Eco Marine Kayak Tours. I was still in awe when I arrived at the coffee shop. “That’s Walvis,” she said nonchalantly. And with the Walvis Bay Lagoon being a Ramsar site, a wetland of international importance and home to a plethora of waterbirds and waders, it is undoubtedly a birders’ paradise. But birds are not the only attraction. We were about to kayak amongst the seals at Pelican Point, which is the end of a sand spit and an important corridor of sand preventing the sea from hurtling into the bay. 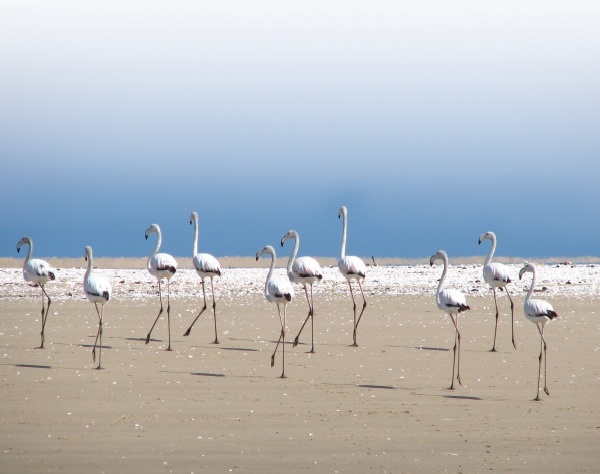 Fortunately for guests, although visible just across the bay, it is reached by a 40-kilometre drive around the lagoon, which on most days is dotted with pink candy-floss-coloured flamingos. When Jeanne began her kayaking trips 17 years ago, with four kayaks, a Land Rover and a trailer, there were only several hundred seals at the Point. Over the last two decades the colony has grown to a population of eight to ten thousand. “I love kayaking and thought others would too,” Jeanne told me as we waited for the rest of the group to arrive. 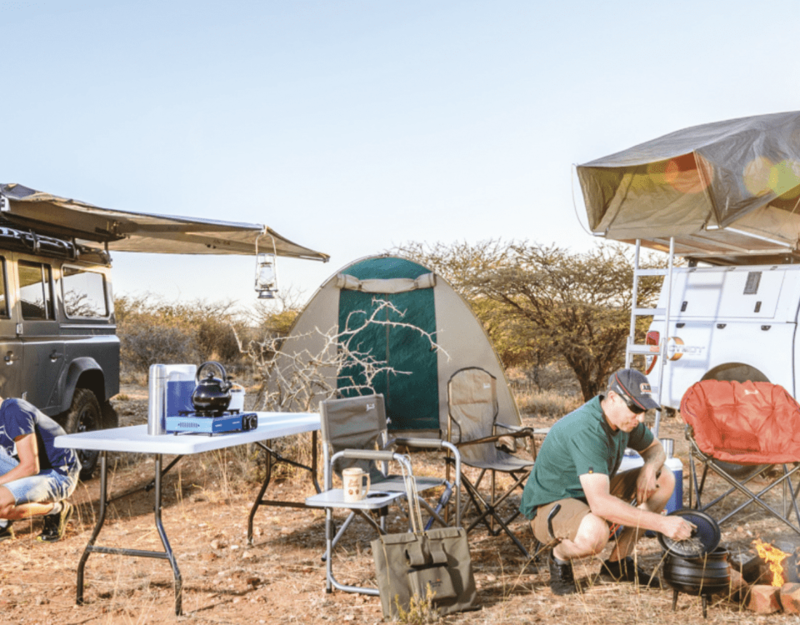 Today, she has a smart safari vehicle colourfully decorated with a scene of people kayaking with the seals and a collection of sleek-looking sea kayaks that are carefully packed on the purpose-built trailer. On the road out to Pelican Point, before we had even reached the white mounds of the salt works, she had put the group at ease about kayaking. (No experience is needed and the age group is generally 3–300.) We were looking forward to meeting the seal pups, which she told us were always eager to come and play. After a short 4×4 drive along the soft beach sand, we parked on the shore and were quickly kitted out in waterproofs and life-jackets. Looking more like we were about to step onto the moon than paddle into watery realms, we were pushed out onto the still, flat lagoon waters. As anticipated, the seals swam to us inquisitively and looked at us wide-eyed, probably in surprise as well as greeting. They leapt and dived around us in glee (or so it seemed), disappearing into the water and occasionally nibbling on a paddle. Jeanne laughed, eyes shining brilliantly, calling to them, “Kom, kom,” (Come, come). The gentle water journey, surrounded by friendly seals, was a perfect introduction to Walvis Bay and its aquatic treasure, the Walvis Bay Lagoon. This really was the way to experience the town – the less tourist-oriented sister to Swakopmund that lies just 30 km to the north. I was discovering that Walvis has many of its own attractions. Kayaking with the seals is just one of them. Another local delight is the greater and lesser flamingos that frequent its waters, only flying off to Etosha and the Makgadikgadi Pans to breed when there has been sufficient rainfall – never a given in this part of the world. I discovered even more wildlife wonders at the small and charming waterfront. “Have you seen the dolphins?” I heard someone say from behind me. I swivelled and located the person behind the voice. Pixie-like Monique Lloyd sat on a bench below Mola Mola’s turquoise-blue sign. It read: ‘Happy day. Enjoy the view’. I was beginning to like this place more and more. Sure enough, there was a bottlenose dolphin swimming in the water in front of me. 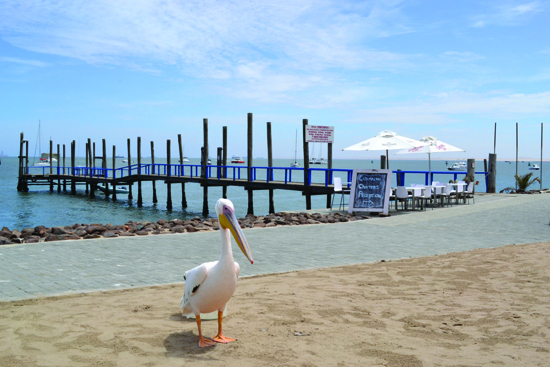 On previous visits to the waterfront, I had sat and watched flamingos for hours from the deck of the Musselcracker restaurant, which boasts the best coffee in Walvis Bay. I had also watched pelicans sitting on the poles of the jetty or waddling down the path, but dolphins were a first. I joined Monique on the bench to learn that she is a skipper for Mola Mola boat cruises and had just returned from a morning on the water and a sighting of a humpback whale. A ‘born-free Namibian’ as she described herself (that is born after Namibian independence in 1990), Monique told me that she wouldn’t trade her unique outdoor office for anything in the world. She also filled me in on the waterfront animal antics. Every year youngsters fall off the pelican breeding platform out at sea and the ‘Pelican Nursery’ at the waterfront adopts them and nurses them back to health. Their latest ‘foster child’ is Lady Gaga, so called because she dances for her fish, wings outspread. She also likes to use the walkway as a runway, regardless of who’s around. Lady Gaga is not eager to leave her adopted home. “It’s not just the fish that keep her here,” Monique informed me. “She has lost her heart to one of the skippers.” Then there’s Fritzie, the Cape cormorant, who sits on your shoulder like a pirate’s parrot; a crow they decided to call Jon Snow (after the hero in the Game of Thrones), although Sheryl and Russell were strong contenders; the skuas ‘who are like seagulls on steroids’; and the five seals that climb onto the cruise boats to entertain and enthral all on board. Bubbles is a favourite because she loves to give hugs. I left Monique and went to explore the relaxed and rustic waterfront. The mist had lifted, the sun had emerged and the southerly wind had come up, as usual. The late afternoon soon drew me back towards the salt works to watch flamingos against the sparkle of sunlight and to savour the last moments of a day well spent with feathery and finned friends. A drive around the lagoon towards the salt works and Paaltjies, a popular fishing spot, to view myriad bird species. Follow the main road (Union Road) as it becomes 5th Avenue and curves at the harbour into Atlantic Street, leading you right to the entrance of the Walvis Bay Yacht Club and the Waterfront. The road continues to the Esplanade, skirting the lagoon, towards Paaltjies and the flamingos.